Fireman Sam Talking Soft Plush Cuddly Toy 12"
The new Fireman Sam Rescue Playset Mini consists of a small fire station, a ramp, and a turntable DieCast Vehicle Venus. On the Mini Playset many of the adventures of Fireman Sam and his friends can be so enact. 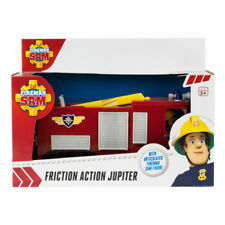 Firefighter Sam - The Cast Mini Series - Fire Station & Jupiter Play Set. Firefighter Sam and his colleagues have a lot to do in the tranquil town of Pontypandy. - Vehicle Die Cast Jupiter. Size Station: Width 12,0 x Depth 10,0 x Height 10,0 cm, incl. FIREMAN SAM. FIRE STATION. USED AND BOXED. MAY CONTAIN A MINOR MARK. AS PER THE PHOTO. Fireman Sam Pontypandy Fire Station Playset. Fireman Sam 5 pack figures Norman, Penny, Sam, Tom & Nurse Flood play set. Condition is New. Dispatched with Royal Mail 2nd Class. For ages 3 and over Create your own Fireman Sam rescue adventures with the Pontypandy Fire Station. This portable playset opens up to reveal lots of features such as a working lift and fireman's pole, and double doors that open up. Fireman Sam Pontypandy Fire Station. Create your own Fireman Sam rescue adventures with the Pontypandy Fire Station. This portable playset opens up to reveal lots of features such as a working lift and fireman's pole, and double doors that open up. Fireman Sam Toy Helmet with Sound & Catchphrases. Now you can be just like the hero next door with this Fireman Sam Utility Belt with Jacket from Character Options. Once the jacket is on you will feel like a real hero! Use the various accessories to help with your brave rescue mission. WORKING FIREMAN'S POLE. USED, IN GOOD CONDITION BUT JUPITER HAS NO DOOR MIRRORS. FIRE STATION HAS CARRYING HANDLE. SIZE OF FIRE STATION WHEN CLOSED IS:- 8 1/2" LONG X 6" WIDE X 11" HIGH. DROP DOWN LOCK. The perfect gift for Fireman Sam fans! Sam & Scissors accessory. Add to Favourites. Ages 3 Years . Compatciable With Character Options Playsets! Press Sam's hand, and this soft cuddly toy will say phrases from the show. Add to Favourites. Role play your favourite character. 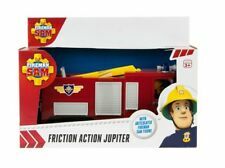 Fireman Sam Engine Friction Action Jupiter Fire Truck Large Sam Figure Toy. Includes: Fireman Sam, Norman, Dilys, Elvis and Pilot Tom. Scaled for play with small Fireman Sam toys. Add to Favourites. 1 x BOATHOUSE. PUSH ALONG NEPTUNE SEA RESCUE BOAT. VERANDA FIRE BOARD. MINOR PLAY MARKS. Fireman Sam. Nurse Flood. Suitable for children age 3 . Add to Favourites. Articulated crane arm. 24cm wide x 13cm (not including the ladder extended). Engine has opening doors. Large version. Add to Favourites. Make up your own Fireman Sam adventures with the Fire Station Playset! Fireman Sam Fire Station Playset & Venus. Working Fireman's Pole. Free-wheeling Venus. Fire Station. Fireman Sam Mountain Rescue 4x4 vehicle / jeep. Very good used condition. Both wing mirrors and front and rear hooks are in tact. Stickers are in great condition too. There's the odd scuff on the roof, otherwise in perfect condition. Prism 2013. Ref 03367. Any questions please just ask. I have other similar toys for sale and will happily combine postage if you contact me before paying. From a smoke and pet free home. Established and reliable seller with a 1000 100% feedback. • Included: Fire Engine, 2x Sam, 1x Tom, 1x Nurse Flood, Penny & Norman. • Friction powered fire engine with ladder, crane arm, and opening doors. Add to Favourites. Fireman Sam. Mountain rescue helicopter. Opening doors. Push button rotor blades. Add to Favourites. Fireman Sam. Mountain rescue helicopter. Opening doors. Push button rotor blades. Add to Favourites. Larger version. City of Ponty Pandy with the following features and accessories Firefighter Sam and his team have a lot to do in the tranquil town of Pontypandy. Fireman Sam. - Rails - suitable for all Mini Die Cast vehicles. Fireman Sam Fire Station Playset Carry handle Opens up - fastener on side Working bell on one side Working firemans pole Fire engine can be driven in It's in good condition, has some scratches and scuffs from play but nothing major. NB it has no doors on the front but this has not affected my children playing with this - in fact I didn't even know it had doors until I saw another one! Also there are no other accessories included, just what's shown in the photos. I also have lots of other Fireman Sam toys for sale. Any questions please just ask. From a smoke and pet free home. Established seller with 100% positive feedback. Fireman Sam Mini Jupiter Fire Engine Boxed Toy. Includes: Helicopter, 2x Tom, Nurse Flood, Penny, Sam & Norman. Friction powered helicopter with rotating propellers & opening doors. Add to Favourites. Fireman Sam - Set 2 in 1 Fire Engine Venus & Water Gun. Fireman Sam and his colleagues have powerful thing to do in the peaceful town Pontypandy. Movable character Fireman Sam. - Loading ramp with step function. Fireman Sam Rescue Playset. Fireman Sam 5 Piece Rescue playset includes :1 x Rescue Vehicle. 1 x Fireman Sam Figure. 1 x Jupiter Fire Engine. Fireman Sam. Rescue playset. Action vehicles with opening doors. Suitable for children age 3 . Fireman Sam Convertible Fireman Sam. Convert Sam's Jupiter Fire Engine into the man himself. Everyone's favourite fireman. Convert Sam's Jupiter Fire Engine into the man himself. Make up your own Fireman Sam adventures! Our product range includes kids toys such as the excellent Fireman Sam, Peppa Pig, Air Hogs, Spongebob, Scooby Doo, Ben & Holly, Mickey Mouse Clubhouse, Twirlywoos, Paw Patrol and many more! 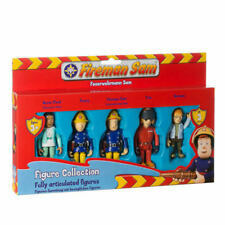 Includes Fireman Sam figure Hours of fun for your Fireman Sam fan! Sam is off to the rescue in his fire truck! Friction powered fire engine with ladder, crane arm, and opening doors. 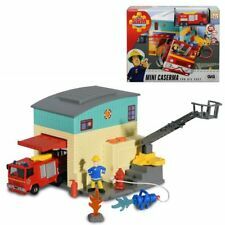 Fireman Sam - The Cast Mini Series - Set Fire Rescue Centre. Fireman Sam and his colleagues have powerful thing to do in the peaceful town Pontypandy. - Suitable for all Mini Die Cast Vehicles Series Fireman Sam. *NEW* New 2017 / 18 Fireman Sam Fire Station Rescue Set Pontypandy Rescue Condition is New. Dispatched with Royal Mail 2nd Class. Includes kitchen, rec room and a turn table for Jupiter to be turned and directed out of the opening doors. Use the carry handle to take Sam and the Deluxe Fire Station to the next mission! Fireman Sam Deluxe Fire Station Playset. Huge Firestation playset with Fire Engine turn table. Includes bell on the side of the station. I`ve also included "Besie" An old fashioned fire truck as shown. Create your own Fireman Sam rescue adventures with the Pontypandy Fire Station. This portable playset opens up to reveal lots of features such as a working lift and fireman's pole, and double doors that open up.